Umite Chef Stainless Steel Toaster Oven Tray Pan Ovenware Professional, is made of high quality 430 18/0 stainless steel without any coating or other materials. It's healthy for your daily use and help you to get rid of toxic aluminum products. No more toxic substance into your food unconsciously. 2. Please clean and dry the baking pan after using for its durability. 3. Make more delicious,have a good time. 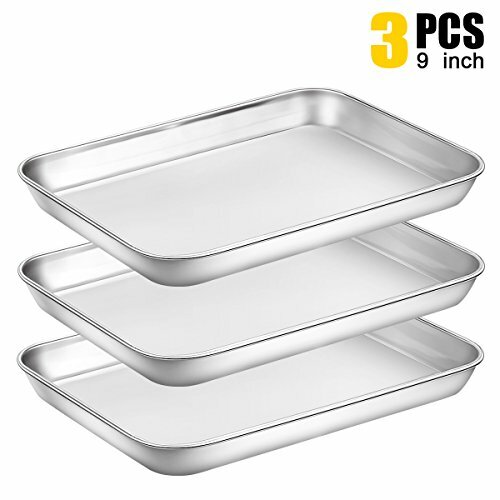 ◆ MATERIAL: Umite Chef 3 piece sheet pan is made of premium 430 18/0 stainless steel, strengthen rust resistant. ◆ HEALTH COOKING: NO toxic coating, NO more coating chips or aluminum fall into your food unconsciously. ◆ SMALL DESIGN: A small size toaster oven pan made for small food. Smooth roll edge, No rough spot, Superior mirror finished surface, Easy-clean, Dishwasher Safe. ◆ VERSATILE: More than a cake pan! Use for your cinnamon rolls, sticky buns, brownies, corn bread and fruit cobblers. ◆ WARRANTY FREE: Food grade materials. 100% Quality assurance, worry free shopping. 9 x 7 x 1 inch.